While breeding, training and competing with so many dogs over the years, Ceri Rundle and her father H.Glyn Jones had continuously been on the look out for an affordable, top quality dog food but found little or no success. They quickly learned that the 'less expensive' options proved to be a case of false economy with the dogs generally losing condition, lacking stamina for work and generating plenty to clean up. While the premium quality rations were beyond their price range. This eventually led Ceri to make a major, and life-changing, decision: To develop her own range of dog foods - CSJ. Ceri's CV in the dog world is without doubt second to none. Her achievements are well documented and include being the very first lady to appear on the BBC2 TV series 'One Man & His Dog' and to represent Wales in the first Young Handlers competition held at the Supreme International Championships at Armathwaite in 1980. Later Ceri went on to become the first lady to qualify for the Welsh National Team with her homebred dog, Bwlch Hemp in 1996, Reserve in 1997 and later earned 2 further national ‘caps’ with two Hemp sons, Moel Cap and Moel Nip. Cap also partnered Ceri at the World Trials in Ireland in 2005. Ceri was the first lady to be elected on to the Panel of National Judges for Wales which has allowed her to judge in USA, Europe and Scandinavia and she was also honoured to become Chair of the North Wales Sheepdog Society in the early '90s. 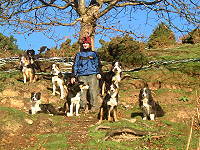 Ceri now spends most of her time promoting CSJ but tries to find time to train and trial her young dogs and continues to develop her famous Moel line of Border Collies (a continuation of her parents famous 'Bwlch' line) which are exported all over the world. Ceri's father (H.Glyn Jones) is a former International Supreme and Reserve Supreme Champion with his dog Gel and Reserve Supreme Champion with the famous homebred Bwlch Taff and five times winner of the Brace Competition on the BBC2 TV series, One Man & His Dog' with his dogs Gel and Bwlch Bracken. 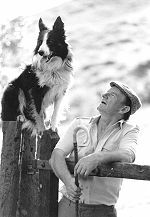 Glyn has produced three training dvds 'Come Bye and Away', 'That'll Do' and 'Take Time' and co wrote the training book that many regard as the 'Bible' of the dog world 'A Way of Life' which up to now has been translated into 5 languages. Glyn has travelled extensively all over the world to judge and hold training clinics and still regularly competes in trials - usually against Ceri! Just thought I would send a quick follow up e mail now that my boys have been on the food for a few weeks. What can I say, we are over the moon with the transition. The Lamb and Rice has worked best for Charlie (with the sensitive tummy) so I have just placed another order for that one, it was also the one one that all three were more drawn to during the taste test. We are continuing to see a reduction in the size of Jakes Lipomas which is fantastic and something we never thought would happen we initially just wanted to prevent them from growing, all three of the dogs seem to have an extra spring in their step which is lovely to see especially in Jake who is back to chasing every duck, squirrel and rabbit! The NO Ake has also been a success. We took Rhandle to the vets for his med check up just in case but since being on the no ake he has been off the metacam completely :-). He had a routine post opp appointment with the specialist yesterday who was also very impressed with his progress, Rhandles shoulder is considered an end stage joint so he had never thought he would be free from strong pain relief. We couldn't be happier and I would like to say a huge thank you for your advice.